So I have a lot of basil plants. We got a little carried away and now have about 30 Sweet Basil plants and 15 Purple Basil. Some of them are getting a little bush-like too! I am becoming an expert at making Pesto! An important skill, if you ask me. And my husband. The other day I made some to bag up and freeze for later and it all smelled so good I couldn’t resist using a portion of it for dinner that night. I wish y’all could have smelled it…smelt it? Either way, it was too good! I had no idea what I was going to make in the beginning but the end result was too good not to share! This recipe is cooking for two, so feel free to double it or fix it up just how you like it. Our chicken breasts we get from the store are ginormous (not kidding) so I actually slice them into two breasts for most of our dinners. If your chicken is also large and you decide not to cut it you will need to adjust the cook time. Also, store bought pesto will work just fine, don’t feel obligated to make your own – however it is worth it and very easy if you decide to give it a shot! My method to this chicken dish is simple. It really is a quick dinner to throw together and has impressive results. Salt and pepper your chicken then spoon on your pesto and spread evenly. Add sliced onions and then your choice of tomatoes. We had fresh red and yellow tomatoes from our garden back in Franklin and they were just begging to be used! Top it off with a little Parmesan cheese! Or a lot of Parmesan cheese! It’s my favorite so I get a little carried away.. I used grated cheese but you can use shredded cheese, or even add some mozzarella. Literally whatever your heart desires. I also added a little dried basil on top for some color and a little extra flavor. Bake and enjoy! I put our chicken over some Bow Tie Pasta prepared with a little olive oil, garlic and cheese. Served here with some oven roasted Yellow Summer Squash and Onions. I literally can’t tell y’all just how good this smells and tastes! Posting this makes me want to have it for dinner all over again! Here is the actual recipe. Enjoy and let me know what you think! 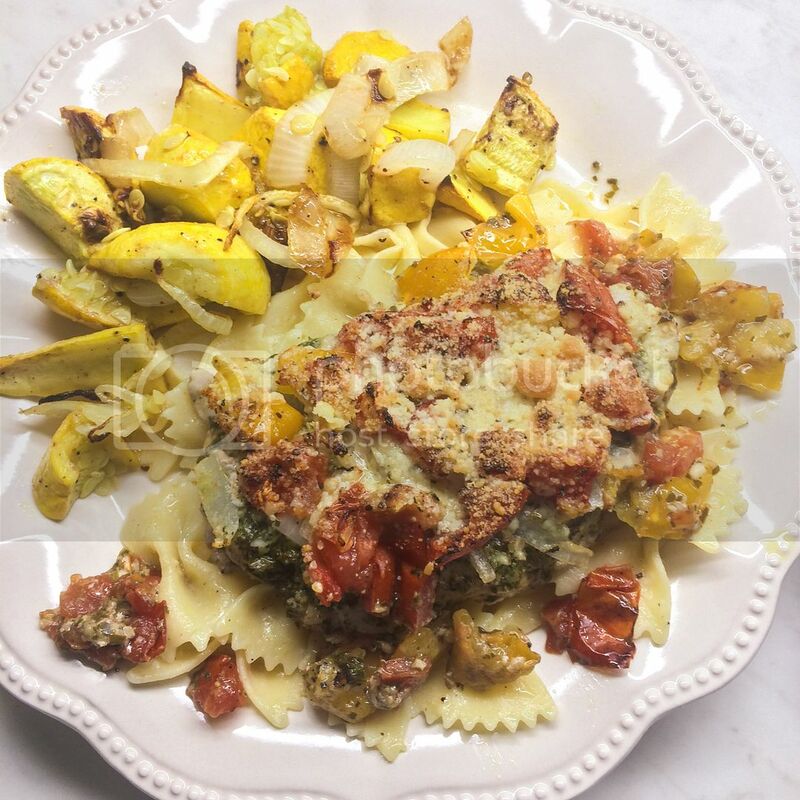 A fresh, flavorful, pesto-themed chicken recipe perfect for an easy to throw together dinner. Pre-heat oven to 375°. Grease pan, add chicken and then top with salt & pepper to your liking. Spread pesto evenly over each chicken breast until they are covered nicely, then sprinkle on your sliced onion and add the diced tomatoes. I drizzled a little olive oil on at this point and added a bit more salt and pepper, but that is completely optional. Add your cheese and dried basil and it’s ready to bake! Bake 30-45 minutes or until your chicken is cooked through. Be careful not to overcook your chicken. Cooking time will vary based on the thickness of the chicken breasts. Serve as is, or over rice or pasta!